Garlic has been grown for thousands of years in many parts of the world. Egyptian workers on the pyramids are recorded as being fed garlic every day to keep them healthy. Garlic grows better and more reliably in containers and raised beds compared to the open ground. The conditions are ideal for this versatile plant. If they are grown in containers as shown above, the compost can be used in the garden or on the compost heap when they are harvested. This avoids the need for crop rotation which can be a problem in larger raised beds. Before recommending specific varieties of garlic for containers and raised beds it's good to understand that there there are three common types of garlic. Probably the best for the average gardener are the softneck varieties, these are the varieties sold in the supermarkets (see more about this below). This type has a slightly milder flavour compared to the other varieties but they store far better. 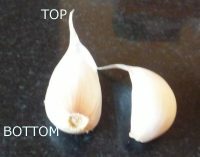 See the section on storing garlic later down this page which describes how you can keep garlic for four months or more. In general this type of garlic is best suited to warmer areas of the UK. The next most common type are the hardneck varieties. They have a stronger flavour and are ideal for roasting whole and general use as well. Their major disadvantage is that they only keep well for a month or so. This type of garlic normally grows better in northern, cooler climates but they can still be grown successfully in the south of the UK. The final type of garlic is the elephant variety. These produce much larger individual cloves of garlic and the taste is very mild, sweet even after cooking. These are the least hardy of the garlic types and they do not store well. In truth, many people consider elephant garlic to be a type of leek, but let the experts argue about that one! As far as the best varieties of garlic go it's a matter of taste and personal opinion. Our personal preference for a softneck is Solent Wight. It has been awarded an AGM by the RHS. It matures late and stores very well, four months easily if the conditions are correct. The yield is good and they look superb. A reasonably strong taste but not over-powering. Another excellent variety that never fails to produce good sized cloves for us is Germidour, widely available at garden centres and online. If you want to try a hardneck variety then our award goes to Purple Italian. This variety matures early, from end June to mid July. Ideal for roasting, they should be used as fresh as possible because they have a short storage period. We wouldn't really recommend growing elephant garlic in the UK except as an experiment but if you want to try then go ahead, all the major seed merchants and garden centres sell them. A frequently asked question is can I plant garlic cloves bought from a supermarket? We say no for a couple of reasons. The first is that the variety is unknown and often the garlic sold in supermarkets for kitchen use is grown in China or similar areas and not suited to the UK climate. A second reason not to use supermarket garlic is that some are sprayed by the growers with chemicals to stop them sprouting. If your raised bed or container is filled with ordinary multi-purpose compost then you have the ideal soil for growing garlic. They prefer an open well-drained soil which can retain moisture. 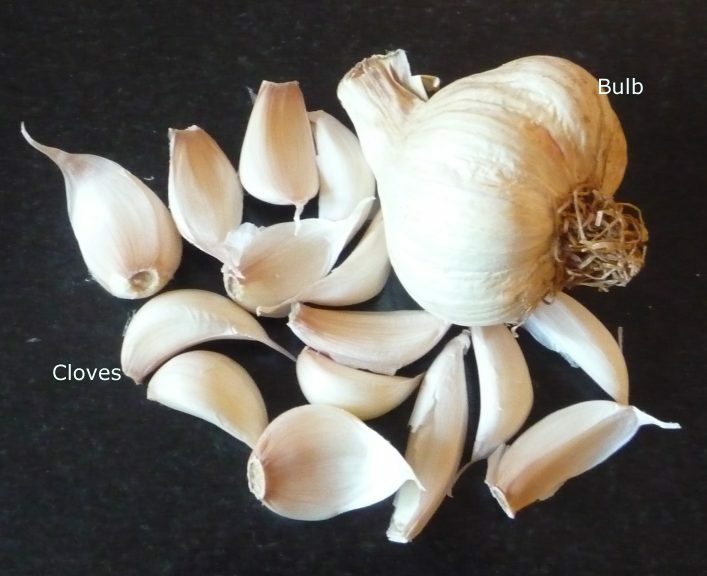 Before planting, look at the picture on the left of a garlic bulb and a garlic clove. When you buy your garlic from a garden centre it will come as a garlic bulb. The bulb contains 10 or more cloves, see bottom of the picture. When you separate the cloves as described below only use the larger cloves for planting, discard the smaller cloves. The first thing to be done is to separate the individual cloves in garlic bulb. To do this pull off the outer skin from the bulb and you will soon be able to feel the form of the individual cloves. Use your fingernail or a blunt knife to break the skin that holds the individual cloves and gently tease out the the cloves one by one. Once the first clove is separated the others will be easy to extract. There's no need to peel off the skin from the cloves, just leave them as they are. Now use the picture to work out which is the top and bottom of the cloves. The top is the pointy end and the bottom is the flatter end. When planting each clove the bottom end goes into the soil with the top end uppermost. The best time to plant garlic cloves in raised beds and containers is October / November time. The reason for this is that garlic grows better when it goes through a cold period (our winter is fine) before it starts fully into growth. This process is called "vernalisation" by the experts but it just means a month or two in the cold. If you miss November, any time up to Christmas will also do as second best. Garlic can also be planted in early spring. 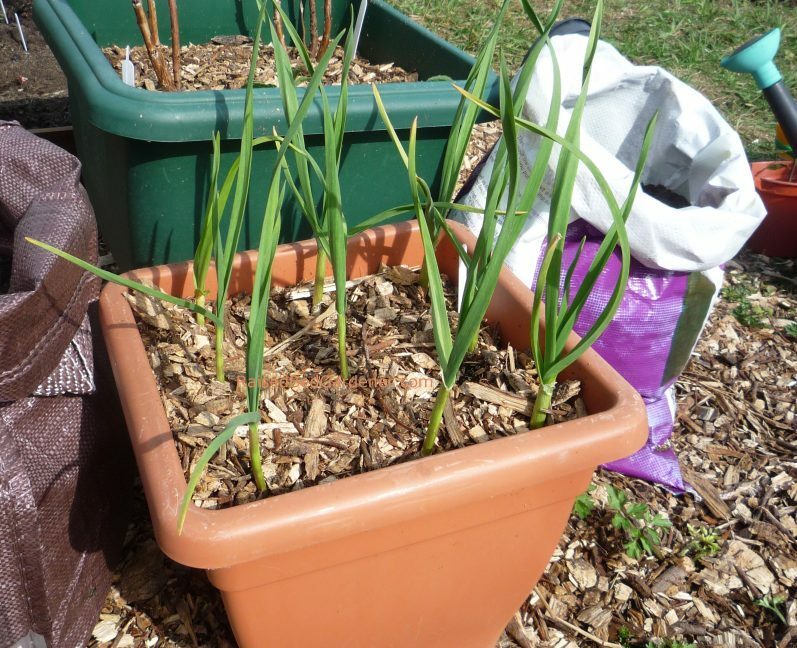 Before planting your garlic cloves lightly sprinkle a long-lasting fertiliser such as "blood fish and bone" or "bonemeal" over the surface of the container or raised bed soil and gently work it in. This will provide a slow supply of nutrients over the next few months. Cloves should be planted 10cm / 4in apart. Use a plant marker or your finger to dig a hole large enough to fit the clove in with the tips of the clove 2cm / 1in or so below the soil surface. Cover with the surrounding soil and gently firm it in. If the soil is dry water it lightly. Mark the position of the cloves because they will take a few weeks to emerge and it's easy to forget where you planted them. Garlic requires very little attention during its growth. For the first six weeks check them frequently because as the green tips emerge birds may well try to peck them out and some birds are very good at doing this. If they attack just the occasional garlic clove then simply replace it in the soil and firm back down. If birds become a problem then cover the raised bed / containers with horticultural fleece. Our normal care routine for raised beds and containers should take care of garlic. It's also worthwhile reading the paragraph on the specific feeding and watering needs of garlic (see here). Different types and varieties of garlic take different times to mature. Most varieties will mature around August though some early varieties can mature as early as June. Look for leaves which are starting to turn yellow and stems which begin to bend over, this is the time start harvesting garlic. Garlic can be eaten as soon as it matures and this will give them a milder flavour. Most of the bulbs though should be carefully dug from the soil and loose soil removed. Harvest on a warm day because the next step is to let the garlic (with the stems and leaves) dry out in the sun. Ideally they should be placed on netting or horticultural fleece supported from the ground so that air can circulate around the bulbs. The longer you can dry them out the longer they will keep in storage, up to a week is fine. But more practically, a day or two in the sunshine will do the job sufficiently. 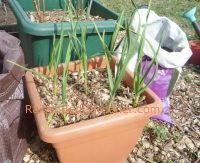 If rain looks likely, remove the garlic cloves to a dry airy position and move them back into the sun later on. When the bulbs have been dried cut, the stems so that only 3cm / 1in or so remains and store in a cool, dark and airy place. Many people store their garlic in the kitchen but the light levels and warmth will cause them to sprout - dark, cool and airy conditions are best. The major pest of garlic is birds pecking out the newly sprouted leaves. See the paragraph above (click here) for what can be done to prevent this. As far as disease is concerned, many fungi can occasionally attack garlic. If this happens there is little that can be done other than pull out affected plants and burn them before the infection spreads. Keep a careful eye out for rust which spreads very easily. It starts off with a few brown raised spots on the leaves. Cut off affected leaves immediately and burn. Wash your hands before touching any other plants. Prevention of these diseases consists of keeping the garlic plants watered but slightly on the dry side. Make sure air can circulate around the plants. The whole point of growing vegetables and herbs is to eat them and we love to experiment with fresh ingredients. Along our travels we came across the Garlic Farm on the Isle of Wight who produce the most fantastic garlic ever. Our very particular favourite is their oak smoked garlic - supremely delicious. It's not practical or economic to oak smoke your own garlic so we suggest you give them a try - their website can be found here. There are so many recipes which use garlic that however much you produce there will always be a use for them. 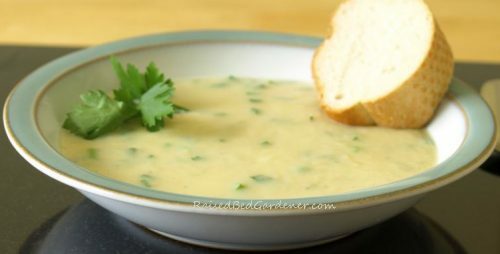 One of our favourite garlic recipes is roast garlic soup which can be found here. The key to this soup is roasting a whole garlic bulb for an hour and a half which sweetens it up deliciously. A tried and tested favourite recipe is garlic prawns, ready from start to finish in half an hour. Our sister site has a delicious version of this recipe here. Dauphinoise potatoes sounds very posh and complicated but in reality it's only potatoes, cream, cheese, garlic and a few herbs. A good recipe can be found here.